Common Sense Media is asking for sanctions against EA for its recent campaign promoting Dead Space 2 with horrified mothers. EA and Visceral Games took a different approach with their marketing campaign for Dead Space 2, showing the reactions of a focus group made of conservative mothers rather than the target audience, claiming: "Your mom hates Dead Space 2." Common Sense Media isn't amused by the campaign, not because of its nature, but because the family advocacy group feels the ads are overly appealing to kids under 17. 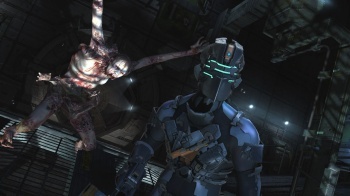 Dead Space 2 is recommended for kids 17 and older by the Entertainment Software Ratings Board, so Common Sense Media hopes the organization will sanction EA for its use of the ad campaign. Common Sense Media Chief Executive Jim Steyer wrote a letter to ESRB president Patricia Vance, saying he believes that EA is in violation of the ESRB's Principles and Guidelines for Responsible Advertising Practices by making ads that are "irresistible" to kids. Vance disagrees, replying to Stayer with: "Just because a product desires to be seen as 'cool' or 'edgy' does not in and of itself necessitate that it is directed at children." EA spokeswoman Amanda Taggart also revealed that the company works hard to ensure it follows ESRB rules, and had the campaign approved before it aired. Common Sense Media is in a unique position because of the fact that it praises violent games for their strengths while ensuring that parents know they're not for kids. I can see where the organization is coming from with the Dead Space 2 campaign, but I have a feeling it forgot one key point: Everyone has a mother. There's no way it can be proven that EA was targeting a segment of consumers younger than 16 when plenty of people 17 and older also have a mom.